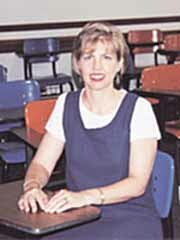 Mary T. Brownell’s research focuses on general and special education teachers. Her first large-scale study investigated the variables contributing to attrition of special education teachers in Florida. High teacher attrition rates, combined with chronic teacher shortages, force many school districts to hire underqualified personnel to fill instructional positions in special education. Through a grant from the U.S. Department of Education, Brownell and her colleagues studied a random sample of 1,570 special education teachers across the state using both quantitative and qualitative methodologies. They concluded that school climate, stress and appropriate certification were key predictors of teachers’ career decisions, and that school districts and institutions of higher education could do much to mediate these variables. Because inclusion of students with disabilities into general education classrooms figures prominently into the national agenda for education, Brownell believes that professionals interested in improving the quality of the teaching workforce must take a serious interest in ensuring that general and special education teachers are prepared to work together. For the past three years, Brownell and her colleagues have studied two urban elementary schools to determine how a collaborative culture can be established and how it affects teachers’ professional development, inclusion of students with disabilities and retention. In recognition of her research, Brownell has been acknowledged by several national organizations. In 1990 and 1992 she won the American Educational Research Association’s Special Education Dissertation Award and the International Council for Learning Disabilities Dissertation Award. She also won the national Outstanding Scholarship in Teacher Education Award for her work in teacher attrition.